In 3-quart saucepan, heat water to boiling. Stir in lentils; return to boiling. Reduce heat to medium. Cover; cook 30 to 45 minutes or until desired tenderness is reached. Drain if necessary. About 15 minutes before lentils are done, heat oven to 375°F. Spray 11x7-inch (2-quart) glass baking dish with cooking spray. In 12-inch nonstick skillet, heat 1 tablespoon of the oil over medium-high heat. Cook chicken, 1/2 teaspoon of the salt, the chili powder, cinnamon, cumin and pepper in oil 6 to 8 minutes, stirring occasionally, until chicken is no longer pink in center. Remove with slotted spoon to bowl. Reduce heat to medium. Cook onion in remaining 1 tablespoon oil 3 minutes, stirring occasionally, until tender. Add garlic; cook and stir 1 minute. Stir in broth, wine, cooked lentils, chickpeas and remaining 1 teaspoon salt. Heat to boiling over high heat; remove from heat. Return chicken to skillet, discarding any juices in bowl. Spoon into baking dish. In medium bowl, toss all topping ingredients except almonds. Sprinkle topping over casserole. Cover; bake 20 minutes or until apples are just tender. Sprinkle with almonds. Let stand 5 minutes before serving. To toast almonds, sprinkle in ungreased heavy skillet. Cook over medium heat 5 to 7 minutes, stirring frequently until nuts begin to brown, then stirring constantly until nuts are light brown. Lentils are a legume that require no soaking. Before cooking, just make sure you rinse them and pick through for any debris. 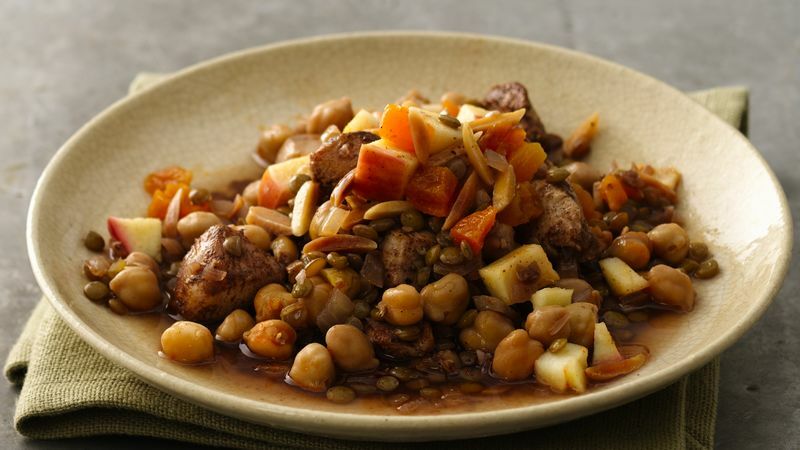 Lentils have an earthy flavor and do well when paired with assertive seasonings, such as the spices in this casserole. Feel free to substitute golden raisins for the apricots in the topping.